The 4th of July is the quintessential American holiday. Rightly so, no food is more emblematic of that holiday than good ol’ American barbecue. The arguments about everything from it’s history to sauce vs. rub can get as hot as a hickory-fueled Texas barbecue pit. Even the word has inspired etymological stories, which we thought was neat, actually. How do you define BBQ? Where do you start? To be sure, you can safely assume that each source will give a history that looks upon their region or specialty favorably. For example, the South Carolina Barbecue Association (yep, they’re real!) 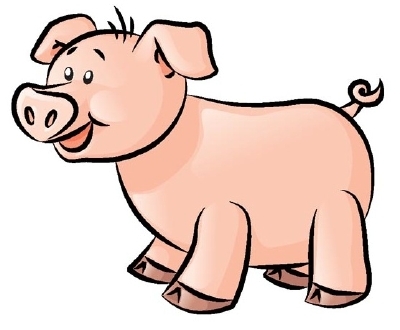 paints a pork-centric, South Carolina-heavy history of ‘cue, claiming that South Carolina is the home to all four types of major BBQ sauces (Vinegar and Pepper, Mustard, Light Tomato and Heavy Tomato), while other states and regions focus on just one or two. For BBQ in general, types of overall preparation and cooking are normally divided into four distinct regions: Memphis, Carolinas, Texas and Kansas City. Each region employs its own prep, methods and history, and the debate over which is best is one we would be happy to have every week. Just give us unlimited access to the food and some loose fitting clothes, and we’ll be okay! Kebabs have always carried an awkward place in the pantheon of grilling options. Normally confined to the wooden rigidity of traditional skewers, more flexible options have emerged. Take the Firewire Flexible Skewers, a handy set of braided steel cables, each 32 inches long. 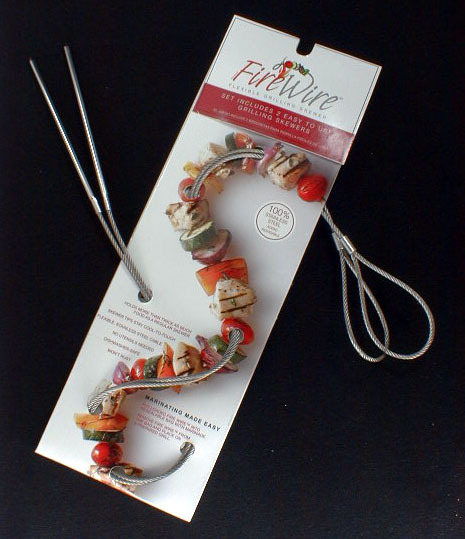 These allow you to loop your chosen meats and veggies to fit the contours of your grill. No more skewer overboard! Plus, they’re dishwasher-safe. Check out the video demo from the Firewire folks, below. We’re smoking herbs! Well, sort of. The folks at Charcoal Companion (which sounds like a dreamy job title, too) recently came out with their Herb Grilling Mat, which is a stainless steel grid with non-stick coating. Open the hinged grids to insert whole herb sprigs or grilling wraps. Then your veggies, meats or seafood go directly over the flavorful smoke. 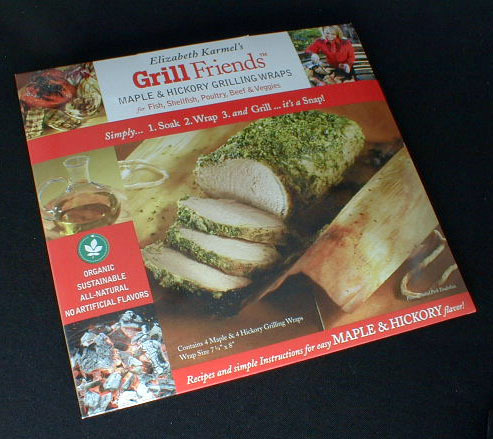 Herb Grilling Mat (#15244, for $15.99) is coming soon, and Grill Wraps (#4789 for $8.99) both can be found here. With seemingly everyone pinching pennies these days, we are always on the lookout for kitchen gear that’s as versatile as it is durable. 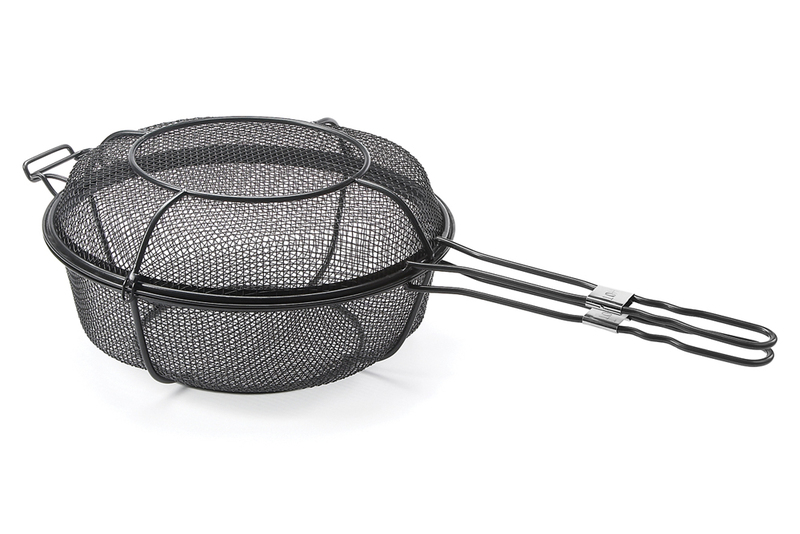 That’s why we like the Chefs Outdoor Grill Basket & Skillet (#2401) so much. The Non-Stick (hello, easy to use!) coating over tough steel brings a good deal of strength. Also, the shallow lid comes off for double-duty use as a skillet. Actually, this treat isn’t too far from the original. Traditionally, pizza was (and still is) prepared in wood-fired ovens that reached 900 degrees, so this is an interesting twist on an old favorite. 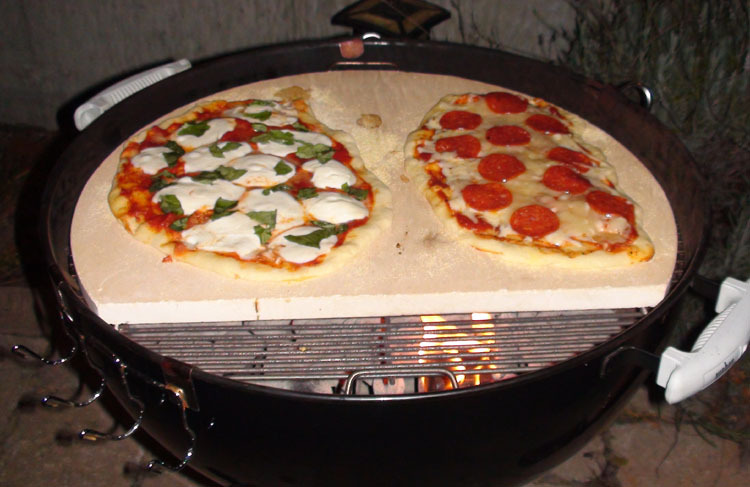 The folks at Old Stone Oven have manufactured a grill-ready pizza stone, which was designed to fit both the popular Weber round, kettle-style grill, or rectangular gas grills. Check out the photo, below, of the stone in action. Read further, and you’ll see one of our favorite pizza recipes. Grilled pizza with smoked mozzarella and fresh ricotta with Prosciutto di Parma, rosemary and pistachio nuts. 1. Roll out pizza dough to fit your stone, about 14″ or so, to give yourself some room to work on the rest of the stone. Spread plenty of corn meal on a pizza peel (rhyming, anyone? ), and slide the pizza carefully onto a pre-heated stone. 2. Keep an eye on the grill, looking for the dough to dry on the top. After about 3-4 minutes, flip the pie over and assemble the toppings; spread ricotta, pistachios, Prosciutto and mozzarella. Keeping the Prosciutto “shielded” by the top layer of cheese will help keep it from browning too quickly, which can produce an overly-gamey flavor. Pizza will be ready once the cheese is melted, outer crust is brown/blackened and bottom crust is evenly brown. 3. Carefully slide your peel under the pie and lift off the grill. Sprinkle on chopped rosemary, and let cool for a few minutes. Drizzle with olive oil before serving. Slice and get eatin! Defining barbecue is more than piecing together the history of a word or phrase, finding the right cut of meat or choosing the best tool to cook it with. Great barbecue, like all food, is reminiscent of friends, family and our fondest memories of both. It takes us back to summer cook outs of our youth, with tangy ribs smoking in the background, and 4th of July celebrations of today, with succulent pulled pork sandwiches and crispy coleslaw. We hope to help you plan the tastiest menu for your Independence Day celebration. And, if you’re in town, celebrate the 4th on 9th…street, that is, and come see us! Of course, if you have any questions, you can always ask directly at mail@fantes.com.